“Crew, prepare the cabin for landing”. Looking out the plane’s window, I spotted a town along a river with a huge golden stupa. Even from way up there I could tell was enormous. Pointing it out to J, I wondered whether it was the Shwedagon (which of course it wasn’t). We descended over fields of brown and green. A few little towns with simple houses sitting along silver streams snaking through the countryside. We landed before I had a chance to see the city of Yangon. As we were going through passport control, we contemplated the line of chaos outside the exit. Cars, taxis, minivans crawled along the drop-off/pick-up zone with drivers and passengers weaving through the tangle. After my first Mingalabar with the customs officer, I was through, changing my pristine US dollars to kyats and extracting a few further kyats from the ATM. J also changed some notes while I sussed out the duty free store. The range of goods was small, but the selection of wines surprisingly large. With a few bottles in hand we met our smiling driver Kyaw, from our local travel agent One Stop Myanmar, amongst the throng crowded at the exit. Shortly after that, J and I were in the back of Kyaw’s car gawking at all the sights along the roadside as we headed towards the city. After a brief stop to pay our agent and collect our vouchers and airline tickets, we checked into our Yangon hotel – Kawandgyi Palace (which we loved – review posted on TripAdvisor). So by now it was mid afternoon, so we thought. With the early departure from Singapore and the short flight, we were a little beat so decided on a quiet afternoon around the hotel and walked along the boardwalks that surround the royal lake. The lake was lovely, with many couples and families strolling around. But we quickly discovered how hot May in Yangon was under that baking afternoon sun. Luckily I had my new best friend – my umbrella – to provide continuous shade as we wondered along the uneven and slightly rickety boardwalk. However, we didn’t walk too for, only making it as far as the little temple built on a slight mud-flat island (Shin Upagot shrine). Set over the lake it was a very peaceful place with couples relaxing under shady trees out of the hot afternoon sun. An elderly monk gestured for us to enter the temple, but we were content just walking around the outside where we could see a golden Buddha statue and other shrines within. Looking over the lake, the huge Karaweik cast a huge gold reflection over the lake. 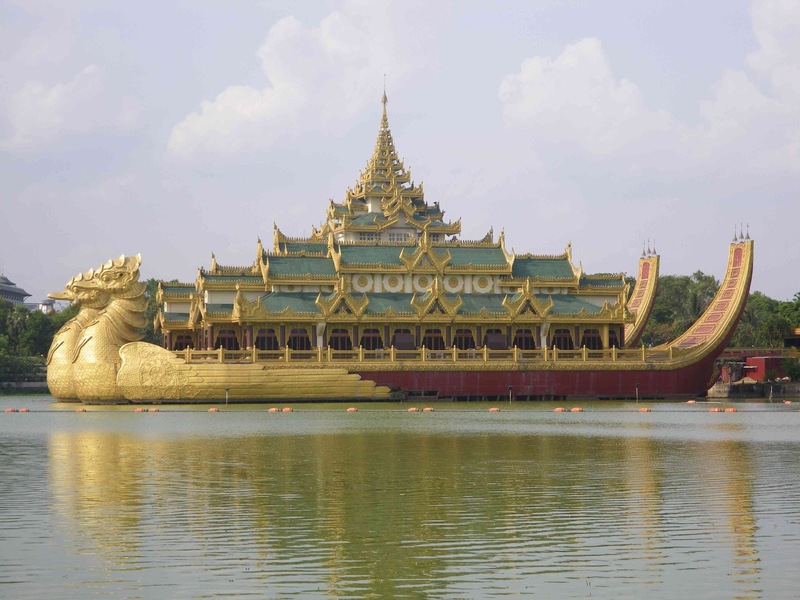 It’s a reproduction of a royal barge and resembles a giant boat with two dragon-like bird heads at the bow, a gold palace with a multi-tiered roof in the middle, and the tails of the bird-dragon at the stern. Though it looked interesting and I was keen to see it, we were so hot with sweat dripping down our necks and back, and we hadn’t bought any water with us. As we walked back, I noticed that the sky seemed remarkably light, given that by my calculations it was getting close to sunset. 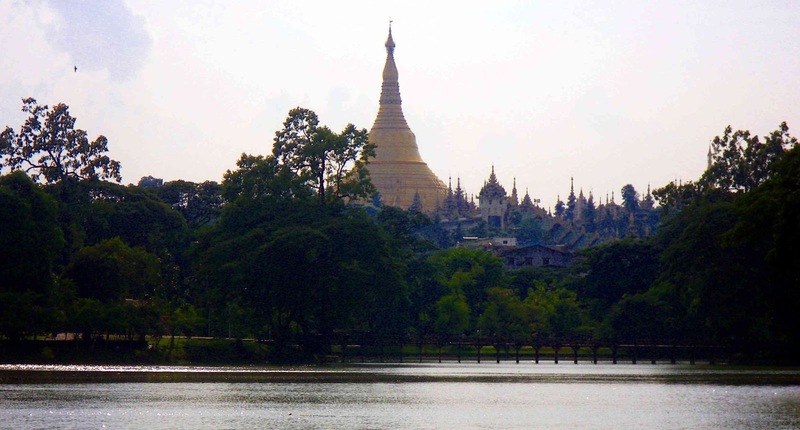 On the hill in the distance Shwedagon Pagoda loomed above the tree-tops over the lake. We had planned to visit for sunset so we cooled off, replenished our fluids and changed into longer pants before heading off. It was only a short walk down the main road. By chance I decided to ask the hotel staff for the time. Turns out, Yangon is one and a half hours behind Singapore, and three and half hour behind Melbourne. So instead of it being (what I thought) five-ish, it was three-thirty-ish. Excellent – some more time to relax. 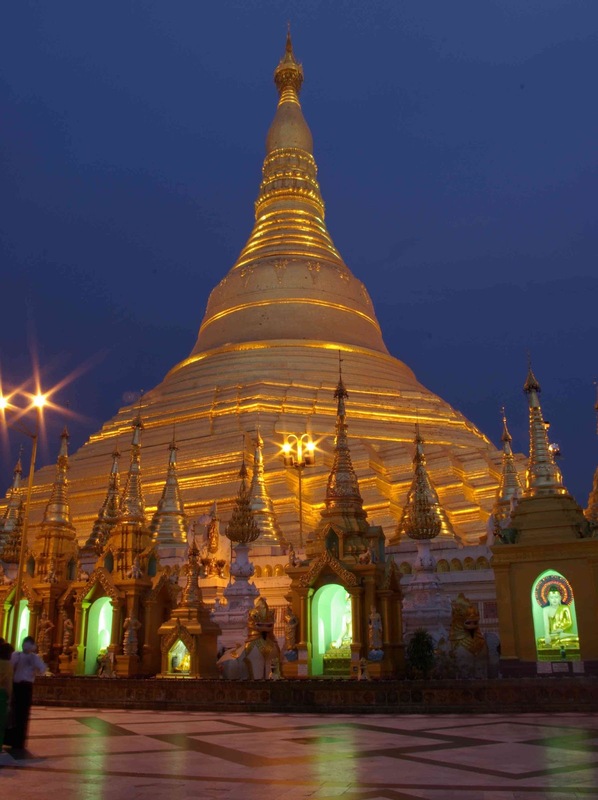 Shwedagon Paya (or pagoda – not sure which is the right term) was bigger, brighter, golder (is that a word?) and more amazing than I had ever imagined. It only took about ten minutes to walk there, plus another ten minutes to cross the major road and round-a-bout that stood between it and the hotel. J and I are veterans of scrossing busy city roads in SE Asia, having no problem in the dense traffic of Ho Chi Minh, Bangkok, and Phnom Penh. 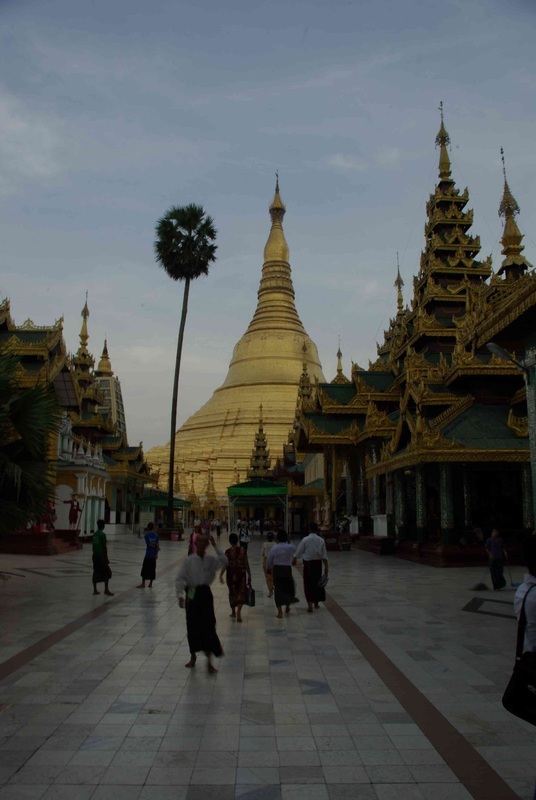 But there is a major difference in Yangon – no motorbikes, just cars, busses and trucks. Just a little bit more dangerous. And the traffic moved steadily around the round-a-bout so breaks and crossing opportunities were few. A few times, we crossed out into the middle of the road, only to turn around an return to the curb as large trucks approached leaving no-where to go. We must have looked like the character from the 80’s game frogger stepping forward, then to the side, then retreating… Once on the other side, J noticed a designated pedestrian crossing a little way down the road. “I think we should cross there on the way back”, he laughed. Back to the incredible pagoda. We entered from the southern stairway guarded by two enormous white clinthes, half lion / half dragon creatures. Removing our shoes before we stepped onto the stairs, we appreciated the roof that protected the tiles becoming like a fry pan and cooking the soles of our feet. There are a lot of steps up, but simply looking around at the people, stalls, and many pictures all the way up, the steep journey seemed to melt into a few simple steps. At the top, we exited only to be stopped in our tracks by the sight of the huge gold stupa. It was almost overwhelming and left me in such a state of wonder and awe that tears sprang up into my eyes. Before I continued, I stopped for a moment of silent reflection, for inner prostrations and mental offerings. Walking in a clockwise direction, J and I slowly explored all the shrines and stupas on the temple platform. I was astonished about just how large the complex was. We spent hours simply looking (or gaping) at the side temples; at the bells; at the many gold Buddhas and disciples; the planetary posts with stations for each day of the week; the incense; the candles; the worshipers and monks; multi-tiered temples; gold gilt and gem encrusted shrines; offerings and prostrations, and the bodhi trees. We also got our first taste of celebrity status (or so it felt). For the first time during our trip through Myanmar, we were pretty much grabbed by a family and pulled into their family photo. Smiling, pointing, bowing and thank yous. More than once we were stopped to have our photo taken with families, school kids and groups of friends. I had a joyful encounter with a group of monks who exchanged being in my photos for me being in theirs. Much smiling and laughing ensued as we showed each other our shots on the digital screens of our cameras. Some little children shyly stared at us from behind mum’s legs. Mum in turn pushed junior out to say hello to the foreigners, encouraging them to say “Hello”. More giggles and hand waving with warm greetings of Mingalabar! Those smiles from that first day will always remain in my memory. As afternoon turned to evening, the scene took on an even more magical atmosphere. 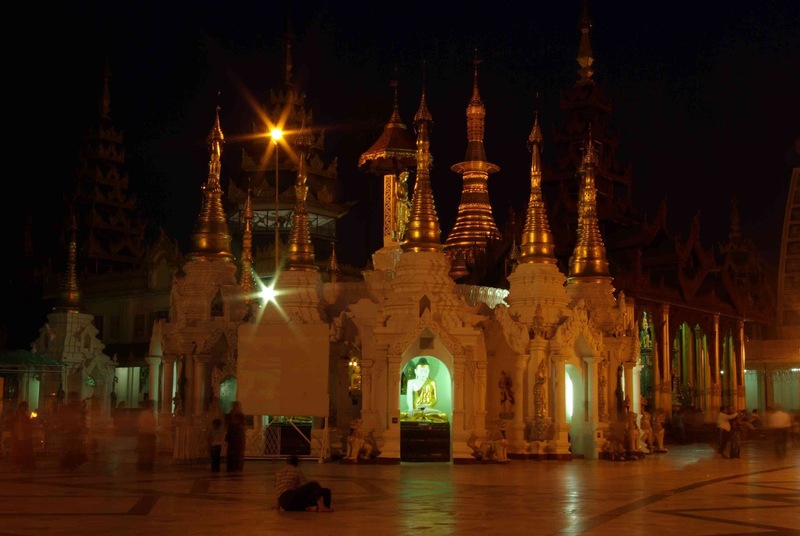 The central stupa shone under many spotlights, with the diamond at the top emanating a bright white glow. The many golden Buddhas appeared more shiny and lit up, some with their own halo of ‘disco’ lights flashing around their serene faces. Even more families and groups arrived to pay their respects. J and I circled three times, taking our time, absorbing it all, stopping to sit and enjoy it all along the way. As the light faded from the sky, a huge thunderstorm threatened near by. Dark clouds were illuminated with lightening bolts and thunder rumbled. You could see the heavy sheets of rain plunging to earth. Looking around, no-one other than us seemed too concerned. J and I were expecting to be soaked at any minute. If nothing else, that spectacular show of nature further enhanced the magnificent temple and made the experience truly amazing. Of course, what I’m not talking about is poor J lugging my camera pack and tripod around the paya as I constantly stopped to take yet another photo. J has a great eye too and gave me heaps of great ideas for shots along the way. Poor J… We spent maybe 3 or 4 hours there taking it all in. But finally I could see he was getting really anxious and unfortunately needed to have a cigarette. He’d done well doing without for so long, and it was very, very hot so it was probably time to head back to the hotel. But I could have easily stayed for many hours more. 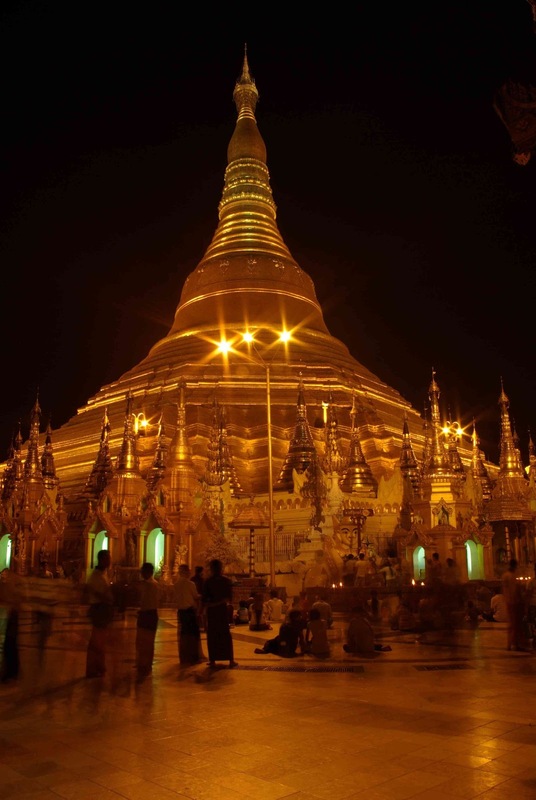 Without a doubt, Shwedagon was (is) spectacular. An absolute must. Even more than what you may read in guide books and travel magazines. This was day one in Myanmar, and it had already become an unforgettable highlight of our journey (of which there were daily highlights). Make sure you allow plenty of time to enjoy, explore and engage fully with the sights, sounds and people if and when you go.